Wildlife Farms, about 20 miles from Stuttgart and a stone's throw from the White River, covers almost 2,000 acres—including 5 1/2 miles of river frontage—full of old-growth hardwood timber, oxbow lakes and flooded fields, all managed for the benefit of waterfowl. It’s in a sizable duck blind in the middle of one of these lakes, a couple of miles out from the lodge, where we find ourselves being schooled in the art and legend of the duck blind sandwich. Nowadays, the guides at Wildlife Farms are carrying on the tradition, making the sandwich for the hundreds of hunters who land in Casscoe to hunt each year. David Barnett, Sally and Daniel’s son, has been a full-time guide since 1998. By his best guess, David says he makes an average of five sandwiches a day, for around 60 days every year. That’s about 5,100 duck blind sandwiches—5,102 if you count the two he made for us, just a few weeks before the season is due to begin. If you have the opportunity to experience this family treasure, we can guarantee it’ll stick with you, too. And like so many of Wildlife Farms’ repeat customers, you’ll be planning another trip before you even leave the place. Spread each slice with Miracle Whip and top one with cheese. On a hot buttered skillet, cook the ham—seasoned with Slap Yo Mama—until desired doneness is achieved. David trims the ham into a square, so it all fits nicely in between the bread. 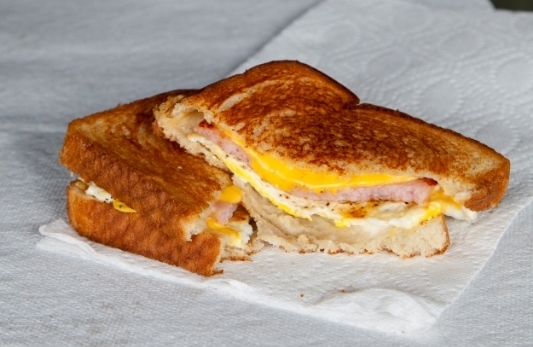 Transfer each slice of ham to the slice of bread with the cheese. Crack the egg on the skillet and let it fry. Season with salt and pepper, trim into a square and place each egg on the ham and cheese. This is when the hot sauce comes in—give the egg a splash or two, then top it off with the other slice of bread. Make sure the skillet is still hot and buttered. 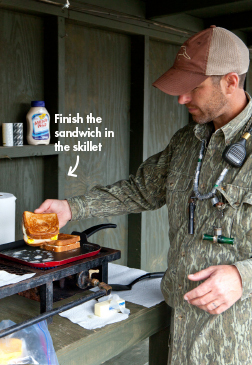 Place the sandwich on the skillet and cook it a minute or two on each side, like you would a grilled-cheese sandwich. Place the finished sandwich on a paper towel, and enjoy.